What would you say are the key benefits to schools taking their pupils on residential trips? The unparalleled experience of learning to look after themselves, gaining confidence, independence and social skills. Do most schools book in the summer, is this the best time to take a trip? Typically, most schools book in the Summer or Autumn months. However, we operate all year round and there is no reason to be deterred from booking in the Winter. The big advantage is that Winter is typically quieter than the Spring/Summer terms, so school staff have more time to plan and organise their trip to Govilon. This is one of the reasons some of our Schools always book a Winter programme with us. What makes Govilon stand out to schools looking to book a trip? And what is the main reason schools come back year after year? We offer very real experiences here at Govilon. 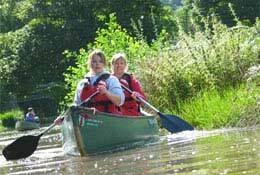 We travel short distances to areas of outstanding natural beauty in the Brecon Beacons for all our activities. Few activities take place on-site at the Centre grounds because we believe it is important for students to experience real challenges in natural settings. Schools come back to us because they see real value in this approach. We're passionate about developing young people at key times in their lives, building their confidence and belief in themselves and those around them. We challenge young people, but we do this in a safe, supportive environment. Obviously pupils will have different levels of confidence when it comes to certain activities, how do you cater for this? Different levels of confidence are a fact of life. We encourage even the most timid or nervous individual to step out of their comfort zone, at a level appropriate to them. We discourage young people from comparing themselves to one another, or to something they've seen on television. Instead, we enable them to push themselves at their own level and ultimately, to try their very best. In doing so, we create a platform for learning and self-discovery. Even if our students don't fully complete a task or challenge, does not mean they haven't succeeded. We do our utmost to instil this ethos into all who pass through our doors. Would you say activity-based school trips are aimed more at secondary schools rather than primary? Or is there something for all? Similarly to the above, there is absolutely something for everyone at Govilon. We are able to tailor-make our programmes to suit all ages, from Year 3 through to Year 13. Often, students come to us in Primary School, then return to us for a second time when they reach Secondary. This gives a fantastic opportunity for progression, and allows us to see so much achievement in the students as they grow up. What are the most popular activities for the students? And what do you offer? We offer a broad range at Govilon. Rock climbing, canoeing, caving, hill/mountain walking, bushcraft, gorge walking, kayaking, archery and mountain biking are generally the most commonly enjoyed. In every instance, we use all our activities as a vehicle for students to learn team and leadership skills, gain independence and grow confidence. Therefore, it doesn't really matter which activities a school chooses for its students. We ensure that each programme is as exciting, challenging and educational as the next. Safety is the number one thought on Teachers minds when they're organising a school trip, how do you ensure that students are as safe as possible when they're on a residential? Our License with the Adventure Activities Licensing Service (AALS) means that we undergo regular inspections to ensure that our safety policies and procedures are current, suitable and up-to-date. Govilon Activity Centre is subject to the National Guidelines for Outdoor Education and complies with the Health & Safety at Work Act 1974, and associated regulations. Our risk assessments are working documents which all staff use as part of their work and are used in conjunction with our operating procedures. They are inspected as necessary and form a fundamental part of our Adventure Activities Licence. A copy is available for inspection on site.